Here are some pictures that Lorelai took of Miller while we were in Destin. It's evident that if I'm ever out of commission as the family photographer, I certainly have a more than capable replacement. Though she may not be grinning from ear-to-ear, she still looks absolutely beautiful. A wonderful photo of the birthday mom. Pap and Chase sharing some quality time together. 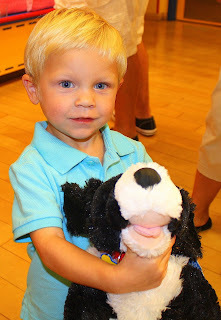 Here are the Fab Four and the animals that they chose at Chase's Build-A-Bear party. Oddly enough, none of them chose a bear. Lorelai and Miller still drag their newest additions everywhere we go. Miller and "Lucky." Miller and Chase chose the same puppy. Looks like great minds think alike. Lorelai and "Lucy Jane Marley Lorelai."